Yes girl!!! 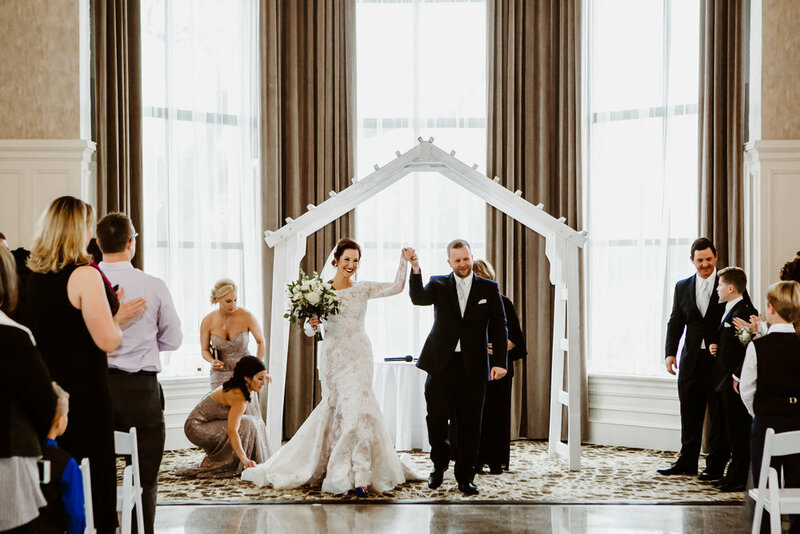 Our stunning bride, Joanna rocked a long sleeve Allure Couture gown and paired it with a beautiful Bel Aire Bridal veil! Joanna's gorgeous bouquet was done by Monarch Florist, you know we love all that greenery!! And instead of bouquets for her bridesmaids, they carried floral clutches that she found on Amazon. Free shipping? Yes please! The couple showed their love for the Cubs with some awesome details in their wedding. Joanna's shoes and garter paid homage to the the team and an insane Cubs themed cake that was actually made by one of her bridesmaid's sisters! 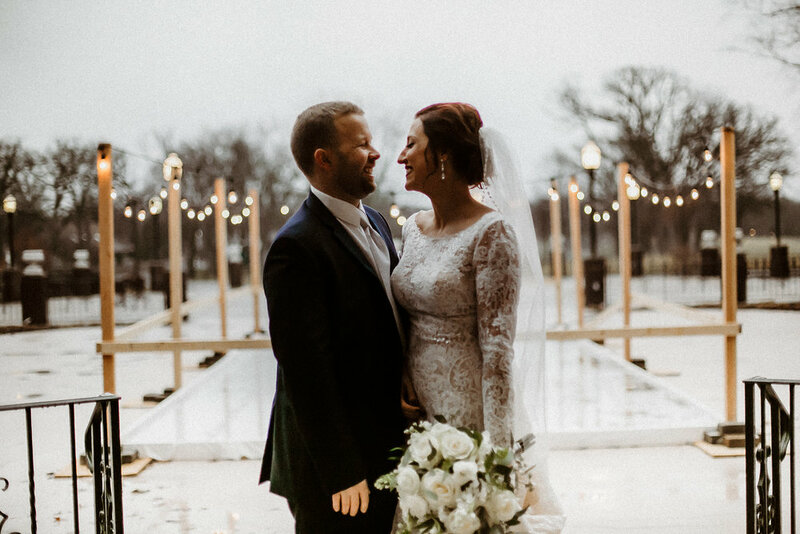 Joanna and Paul tied the knot at Olympia Fields Country Club on a winter afternoon. Maggie Russo Photograpy was there to capture all the sweet moments! 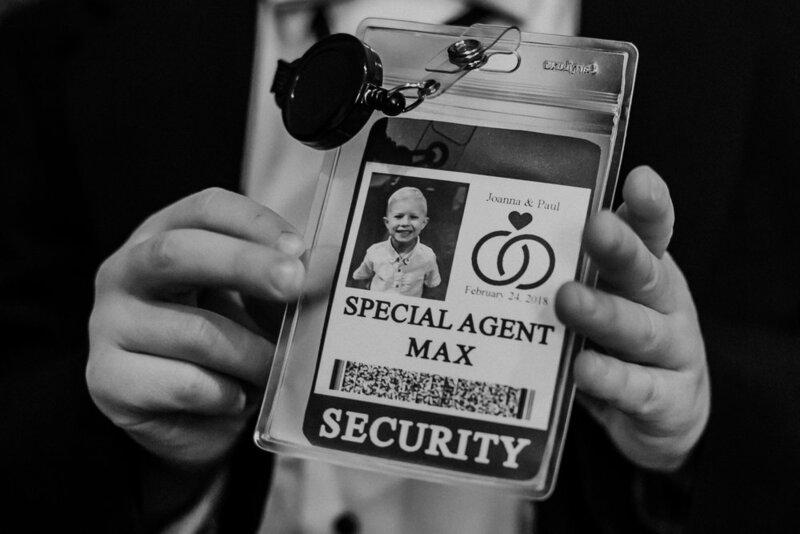 The couple's adorable son, Max, insisted he wasn't the ring bearer, but "ring security". Seriously?? Does it get any cuter than that? The party continued at Teibel's Family Restaurant. Searching for a reception location isn't too hard when there's already one in the family! So how did Joanna and Paul meet?? "Paul and I actually met at Teibel’s restaurant! I applied to be a hostess, sat and interviewed with Paul, and he pretty much hired me right away! Within a few months a group of us would go out after work and our relationship basically grew from there." "Paul proposed me to me in Saugatuck, Michigan. We were on a sail boat in the middle of the lake and he asked if I wanted to sit in the front of the boat for a better view. I was looking around at the lake and when I turned around back towards Paul, he was on one knee holding the ring. The day turned out to be really special because my sister had her baby the exact same day!" What a day!! Was Joanna surprised? "It was a complete surprise! Even though we had been together for 8 years at that point and had talked about marriage, it didn't occur to me when it would ever happen. We go on trips together often, so this wasn't out of the ordinary for us, I just thought it was another small getaway." Props to Paul for pulling that off! When we asked Joanna what her fav part of planning was we were so excited to hear that it was dress shopping!! 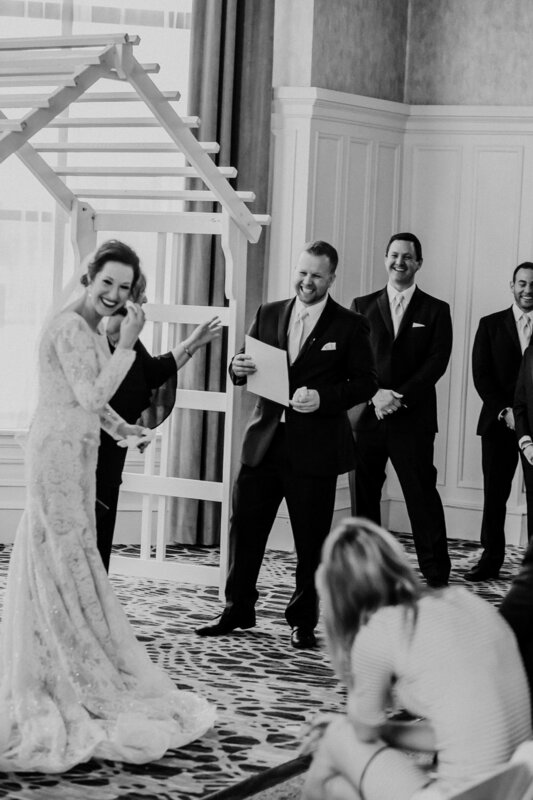 "My favorite part of the planning process was, hands down, picking out my wedding dress! I had a very specific look I was going for and my mother-in-law and best friend got to be a part of it. Even my two sons got to come with me at one point for a dress fitting." What was her least favorite part of planning? 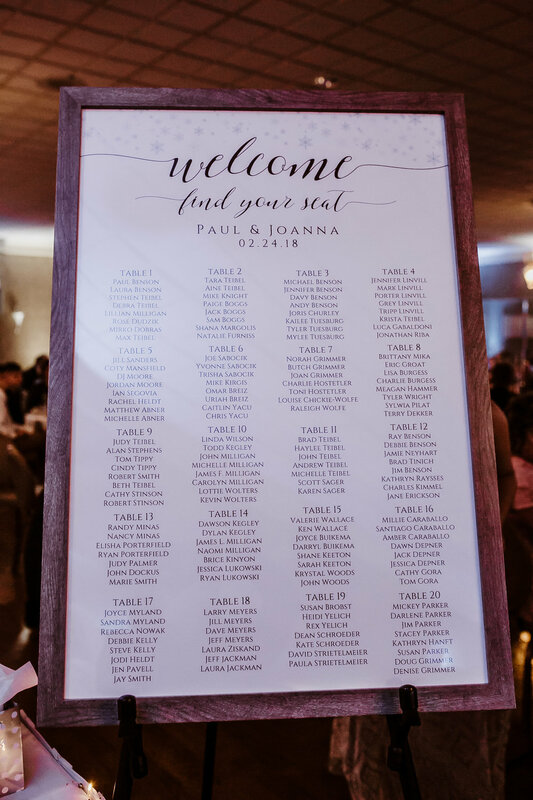 "My least favorite part was the seating chart and RSVP's. So many people changed their RSVP after it was sent back, or didn't send one back at all. It happens though, and I've even done that myself, but when you're hte one doing hte planning it's a lot of work! I have made a point to RSVP right away now to any and everything!! Haha." We couldn't agree more, always RSVP people!!! How about her favorite moment of the wedding? "Oh my goodness, it's hard to pick just one moment. Can I say a few?! Lol. Paul's reaction to seeing me was priceless, best groom face ever. But, we also had some amazing speeches given, our vows were personally written and extremely special. Our son Max's face watching his mommy and daddy finally get married, or probably the most sincere was after the wedding...my son Mirko, Paul's now stepson, wrote us the most tearjerker of a post on Instagram expressing his happiness." Too. Freaking. Cute. What was Joanna's biggest takeaway from the whole process? "My biggest takeaway would have to be, to not stress out about little things. Take in the whole moment without worrying about anyone else that day (except your partner, of course!) Because, as cliché as it sounds, the day does truly go by so fast. Wasting time worrying about mishaps or details the day of is not worth it. I wish I could go back and slow the day down because I feel like I missed so much. Thank goodness for photos to bring it all back though!" Any advice for future brides when it comes to the craziness of planning? "My best advice is do not be afraid to ask for help! I know people always say this, but I feel like brides (myself included) don't want to burden anyone, but we can all use help sometimes. So many people played vital roles during my planning process and I would have never gotten everything done without them. If you start feeling overwhelmed, breathe, and then ask yourself what is necessary to do yourself and what you can ask for help with, I promise asking someone for help is not burdening them." 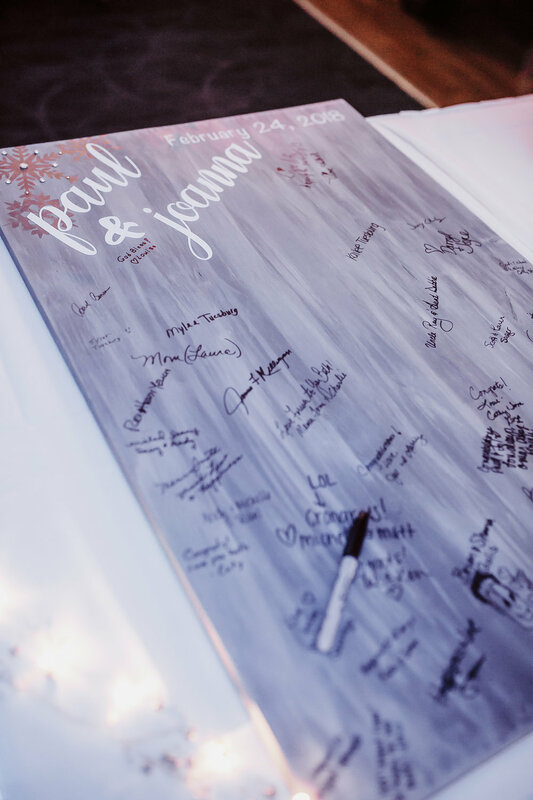 Congratulations Joanna and Paul!!! We wish you nothing but the best and can't thank you enough for sharing your big day with us! Check out more of their gorgeous photos below! !